On December 27, 2015, I woke from a quick, vivid dream. In the dream, I was standing on a viewpoint hill in eastern Washington state. It was a vantage that I don’t believe exists in the natural because I could see all of the Cascade mountain peaks in Washington and Oregon. Nearly simultaneously, all of the large peaks became active volcanoes. The first to erupt was Mt. Rainier, and it’s plume was the largest. 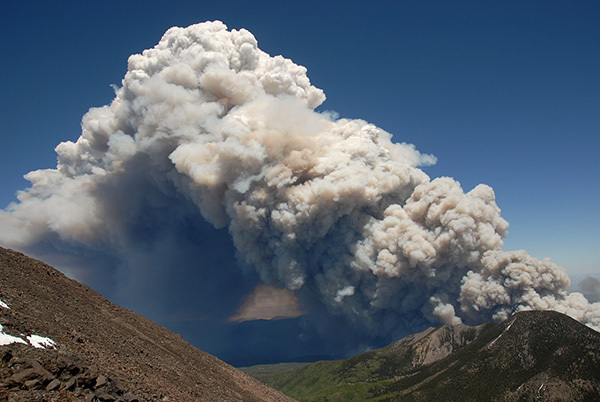 But directly following, all of the peaks began sending up large ash plumes. From where I stood, I could see a line of erupting volcanoes from north to south. Though I was far away, I could feel the shaking of the earth and I could hear the rumble of the explosions. I had a sense that the ash would come my way. I understood that in the few minutes before the plume would reach me, all I could do was prepare. I do not have a clear idea if this was a warning dream of an actual physical event. It is possible, but is it also possible that this dream has spiritual implications for the church? According to Hebrews 12, we are receiving a Kingdom that cannot be shaken. Over the past several years, I have watched with sadness at the shaking that is occurring within the American church. I have sensed God is currently removing what can be shaken—so that what cannot be shaken will remain. God is clearly refining. He is separating wheat from chaff. Can you feel it? He is building strong foundations under our feet, but much of this has been through trial and testing. God is building an unshakable kingdom in His people so that we are girded and prepared, tested, and found strong for whatever comes. Peace came quickly. I stopped crying. He answered me with love, a surprising, “Oh! How He loves us!” kind-of-love. He is brokenhearted over what must be done. But oh, how he loves. Seek Him now. Find your rest and refuge in Him. Only Him. He alone is righteous, and He will do what He must. But if you dwell in the shelter of the Most High, you will find rest in the shadow of the Almighty. God is our refuge and fortress. 1 The Mighty One, God, the Lord, has spoken, and summoned the earth from the rising of the sun to its setting. 3 May our God come and not keep silence; fire devours before Him, and it is very tempestuous around Him. 1 “ Woe to the shepherds who are destroying and scattering the sheep of My pasture!” declares the Lord. 2 Therefore thus says the Lord God of Israel concerning the shepherds who are tending My people: “You have scattered My flock and driven them away, and have not attended to them; behold, I am about to attend to you for the evil of your deeds,” declares the Lord. 3 “Then I Myself will gather the remnant of My flock out of all the countries where I have driven them and bring them back to their pasture, and they will be fruitful and multiply. 4 I will also raise up shepherds over them and they will tend them; and they will not be afraid any longer, nor be terrified, nor will any be missing,” declares the Lord. and He will reign as king and act wisely and do justice and righteousness in the land. 6 For thus says the Lord of hosts, “Once more in a little while, I am going to shake the heavens and the earth, the sea also and the dry land. 7 I will shake all the nations; and they will come with the wealth of all nations, and I will fill this house with glory,” says the Lord of hosts. 8 “The silver is Mine and the gold is Mine,” declares the Lord of hosts. Shawna Elizabeth grew up in the forests of the Pacific Northwest, the daughter of a pastor and a nurse. Now she is a wife, mother of three boys, and a part-time educator in a local Christian school. She has been prompted by the Lord to write and speak of His righteousness. She maintains a “sometimes-blog” called Purple Praise. We Are Crossing Over to the Other Side! I wish Christian knew about this event but I just happened to catch this image when recently looking for my local weather forecast. Your article caught my attention today because it referenced Mt. Rainer and the dream you had that depicted an eruption at this mountain and that it will cause great trouble in the West Coast. Many people would see this as irrelevant but it clearly shows otherwise. That’s beautiful and scary at the same time!!! Breaking news, North Korea fires long range missile. Mountains are synonymous with truth, where truth is reserved. The fire is for destruction. There is a specific truth about destruction about to soon manifest. Washington and Oregon are to the north west extremes of the flow of one arm of the Edenic rivers. Eden is awakening from all its extremities, to fight back for the preservation of the planets life. And God speaks judgement from her midst, which also is known as Zion. I have been praying about all these words of coming destruction, asking God what is happening. At the first of the year He gave me the whole chapter of Hebrews 12 with an emphasis on the discipline of God producing the “peaceable fruit of righteousness to those who are trained by it.” Today as I was driving in my car, crying out for understanding, He quickly said, “In judgment there is mercy.” I do pray for His mercy for all of us in the things that are to come, because the “goodness of God leads to repentance.” Stand up, stand guard, be watchful, be loving, be discerning, be obedient to the One who received all our guilt and shame upon Himself. I dreamt on 1-22 that my children and I were on a small hill in the Cascade foothills on the Western side. It was a sunny day and all of a sudden it became windy and we all layer down in the dry, yellow grass. I said out loud that it was coming from the East which would be Eastern Washington. Maybe the fact that it was summer is a clue. Neville Johnson spoke of being taken in a vision under Yellowstone Park. He said the Lord showed him this place is going to really let go. May the Lord provide clear interpretation as to whether this is an actual (physical) eruption.